It was a cold and rainy April. I live in Vancouver, so rainy is one thing, but this below seasonally average temperatures is getting to me a bit. I’m still wearing snow pants to dragon boat practice, which is somewhat ridiculous considering it’s now May. Anticipating that I’d be cold and drenched to the bone after practice and in need of something soothing the soul, I decided to make split pea soup for dinner. I’ve tried many split pea soup recipes over the years, but I’ve never created one with the winning combination of flavours that has made me choose stick with it as my go-to recipe. It seems simple enough; onions, carrots, celery, ham hock, stock, split peas. Yet, I’ve never gotten the consistency or taste I’ve desired. I found a recipe in the Thomas Keller’s Ad Hoc at Home cookbook a while back, but I’ve flipped past it for 2 reasons; 1) because the recipe seems more complicated than others and 2) in the recipe, you strain out all the vegetables to be left with a smooth soup, (part of what I like about split pea soup is the chunky vegetables). But today I was drawn back to the recipe because I had Thomas Keller on the brain from recollecting my amazing meal I had at TFL to a friend. He is a master and one of the chef’s that I revere the most so I decided to give the Ad Hoc recipe a try. Unlike The French Laundry cookbook which is pretty to look at, but I’ve never attempted anything from, the Ad Hoc book contains recipes that are very approachable. 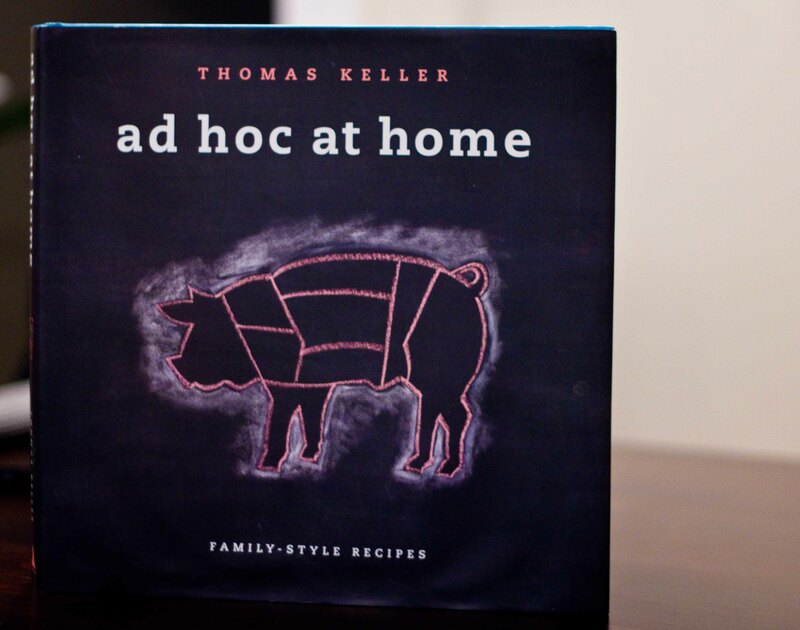 Like all of Thomas Keller’s books, the pages are filled with fantastic photos. In this book not only are there great hints and tips for the kitchen, there are many photos of Keller himself demonstrating different techniques. I think it’s because of this, that I hear his voice guiding me along through the recipe. It’s because of that though, that I have a hard time deviating from the recipe, (like I’m apt to do). The result? The most delicious split pea soup I’ve ever tasted. 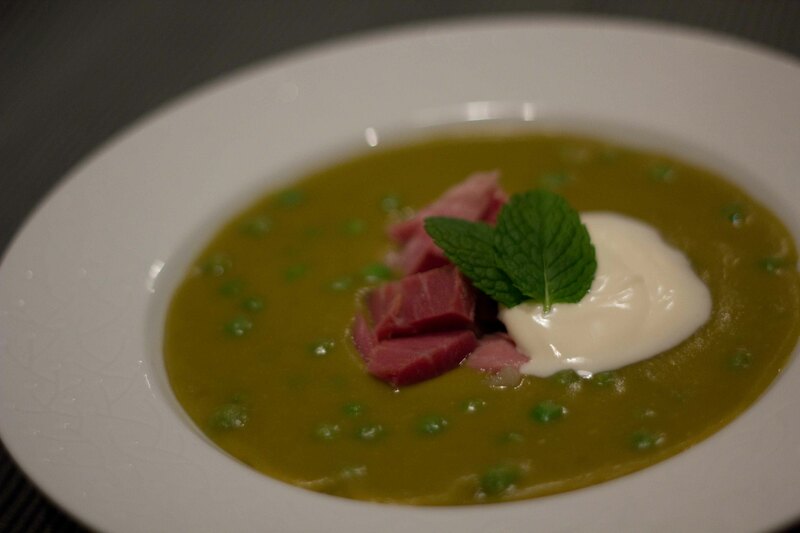 Next time, I won’t add the peas at the end; they just interfered with the luxurious smooth texture of the soup. Heat oil in large stockpot/dutch oven over medium heat. Add the carrots, leeks, onions and a generous pinch of salt. Reduce the heat to low, cover with a parchment lid and cook very slowly, stirring occasionally, for 34-40 minutes, until vegetables are tender. Remove and discard the parchment lid. Return the cold stock and ham hock to the pot, add the split peas and bring to a simmer. Simmer for 1 hour, or until the split peas are completely soft (do not worry if the peas begin to break apart, as they will be pureed). Remove the soup from the heat and remove and reserve the ham hock. Season the soup with 1 tbsp vinegar and salt to taste. Blend the split peas and liquid until smooth. Taste for seasoning, adding pepper and additional vinegar or salt if needed. Pull away and discard the skin and fat from the ham hock. Trim the meat and cut into 1/2″ dice. To serve, heat peas, (he recommends fresh but I only had frozen) and add half to the soup. 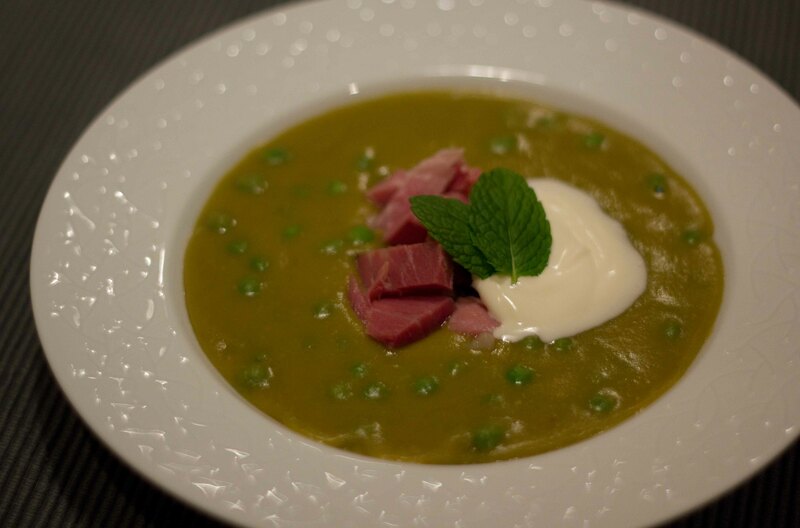 Put the remaining peas, creme fraîche, ham meat and mint leaves in separate serving bowls and serve the soup with the garnishes. Next PostNext Quick Bite – Kingyo Treat!